Hello everybody. Well, winter has finally arrived, but for some people, the flying never stops. Personally, I haven't flown off of the snow for a few years but I still keep a set of dural landing gear with skis attached. A few winters ago, Dino and I thought that it would be fun to fly out of his back yard. I had a Sig Scamp that didn't want to come unstuck and when it finally did, I flew it right into a tree. The only good thing was that when it fell out of the tree, it landed in the snow and didn't break anything. From this experiment, I've developed Steve's rules for flying off of snow. We're going to have a talk about indoor and park fliers at the February meeting. Hope to see you there. Tom (Mr. Fokker?) Kozewski showed an older project, a Fokker D-7, which was retired from contest but is now being rebuilt for this year's Top Gun. New covering comes from a company in North Carolina (I did not get the name) which is sponsoring him. This covering is made of linen, does not shrink, is heavy, and needs to be doped. This covering must be stitched to the wings because glue will wick through the fabric and show. It is colored with Rit dye before applying to the structure. New cockpit detailing is being made of aluminum and steel, and the new cowling is made of aluminum. He replaced its Q-42 with a Q-50 to get more realistic aerobatics; the Q-50 is set-up to swing a 22-10 or 24-8 prop at about 5600 RPM so it will sound more realistic. Estimated weight when complete is 34 lbs. Jack Buckley brought a fun-fly-type fun-scale Edge electric designed for indoor flying. It gets its motivation from a 720mAh 8-cell NiMH pack that weighs 8 oz and costs $22. He keeps the pack going with a Supernova charger that sells for $109 at FMA Direct. This charger is totally automatic, and will discharge as well. It also lets you know how much energy was left in the pack and how much was put in. It handles any NiCd or NiMH pack up to 2500mAh and 25 cells. He believes this set-up will hover when pointed straight up. The Secretary's report for the December meeting was accepted as published in the January newsletter. The Treasurer's report for December was accepted as published in the January newsletter. Field Director's Report:Dennis Cherry had a meeting with Fish and Game. Details were published in the January newsletter. The lock on the field gate has been re-keyed. Old Business:Peter Feil reported that he had completed the annual audit of the treasury, and that all was in order. New Business:The New England Scalemasters Qualifier will be held this year at Garder Airport, Gardner, MA on June 29 and 30. Peter Feil gave Dennis Cherry five keys to replace the ones currently being held by the Department of Fish and Game in Westboro, the Department of Fish and Game in Boylston, the Westboro Fire Department, the Westboro Police Department, and Mike Girourard (for access to mow the field). One of the main causes of a dirty, dusty work area is dust floating in the air. One solution I have found that works quite well for me is a box fan sitting on the floor with a furnace filter taped to the intake side of the fan. I also use a leaf blower frequently to blow the dust off of the rafters in the basement. This blows the dust into the air which is then caught in the furnace filter on the box fan. One step further is to drape an old T-shirt between the box fan and furnace filter. This will help catch some of the fine dust that gets through the furnace filter. This doesn't do much for chemical fumes but is a good way to keep your work area a little cleaner. Collect a few hardware paint stirring sticks. Then glue strips of various grade sand papers to each side to create a collection of useful sandpaper "files." You can also cut the sticks into odd shapes before applying the sandpaper for those hard to reach areas. When working with CyA glue, always get out the glue and the release agent (solvent). They should be on the building table together at all times. I have had the thin stuff run off of a part unnoticed and glue my stomach to the table edge. This can be painful and makes it just a bit difficult to reach the shelf to get the glue solvent. I once glued my hand to a large nearly complete model and I was not in a position to reach the glue solvent, way over on the shelf. I had to call for help to get unstuck. Now, I always get the glue and the solvent (release agent) together. The solvent is ALWAYS within easy reach. 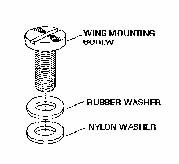 I don't like to use any kind of tool to tighten the wing-mounting screws on my airplanes because it is difficult to know how tight they are without the possibility of crushing the mounting plates, so I use a nylon washer and a rubber washer, then simply tighten them with my thumb and forefinger. This way, I can feel how tight they are getting without going too far and the rubber washer acts like a clutch or lock washer and cannot work loose. These washers can be purchased at any hardware store. The attached picture speaks for itself.